It's hard to believe that in my 30+ years of life, I had never attempted to make bulgogi (the quintessential Korean dish). I've been a little wary about cooking Korean food on my own; perhaps, I have a fear that it won't taste as good as Grandma's. But then I recently started craving Korean burritos from the Chicago restaurant Crisp. The only way I could eat them out here in Houston was by making my own, which would include making my own bulgogi. (Crisp is known for their Korean fried chicken but I truly love their fusion Korean burrito, which I've never been able to find at any other restaurants). 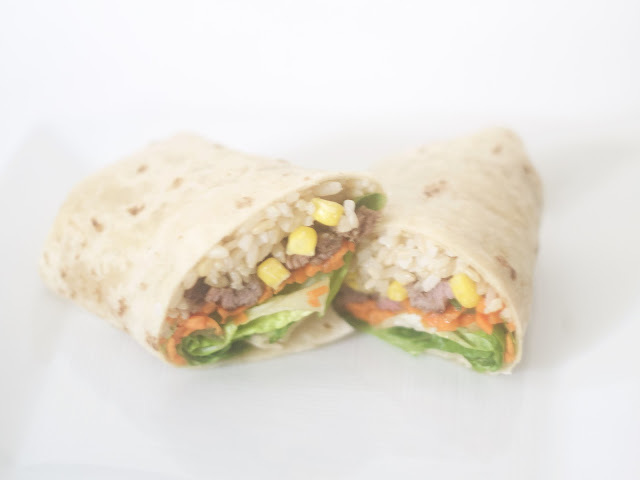 According to the Crisp menu, their Korean burrito is stuffed with bulgogi, white rice, lettuce, corn, tomato, white and green onions and seasoned carrots. It's been about five years since I last ate one of their burritos, so with a foggy memory and the above description, I took a leap of faith and tried my hand at making Korean burritos. The last time I was home I asked Mom Chung to ask Grandma for her bulgogi recipe and she answered, "just google a recipe, I do it!" And googling I did and turned to Maangchi for her bulgogi recipe. Korean seasoned carrots were a bit harder to figure out. My family makes cooked carrots for bibimbap but a raw carrot salad? Googling "carrot" and "banchan" led me to this recipe. And one of the most important parts of the Crisp burrito is the sauce. They serve it which a ranch-like dressing but the burrito tasted infinitely better with their gochujang sauce that is originally used for fried chicken. I made these on a smaller scale by using non-humungous burrito tortillas and the end result was pretty close to my memory of the Crisp burrito. So in case you can't make it to Chicago to sample a Crisp burrito, try your hand at making your own bulgogi Korean burritos! 1. Cook rice (you can use these helpful tips). Then follow Maangchi's recipe for bulgogi and the recipe for seasoned carrots. 2. Mix the ingredients for the gochujang sauce in a bowl until well combined. 3. To assemble the burrito: on a warm tortilla, spread a teaspoon of gochujang sauce onto tortilla (or more if you want it to be extra spicy) and then add a small scoop of cooked rice, a few pieces of cooked bulgogi, seasoned carrots, some romaine lettuce, a small scoop of corn and then sprinkle green onion and tomato---just be careful not to overfill. Then fold in the sides of the tortilla and roll tightly. 4. Slice in half and then enjoy!